Synthetic peptide within Human MEK4/MKK4 (N terminal). The exact sequence is proprietary. 3T3 cell lysates (untreated or treated with PDGF) and human muscle tissue. Our Abpromise guarantee covers the use of ab52958 in the following tested applications. WB 1/5000. 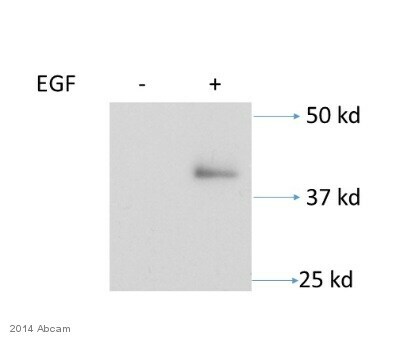 Detects a band of approximately 44 kDa (predicted molecular weight: 44 kDa). ab52958 at 1/50 dilution staining MKK4 in human muscles by Immunohistochemistry, Paraffin embedded tissue. ab52958 has not yet been referenced specifically in any publications. Publishing research using ab52958? Please let us know so that we can cite the reference in this datasheet.